I was three when I came home from a trip to my Grandma Shoots’ house to find that I was no longer an only child. The usurper was ten lbs. of trouble topped by a giant head which had torn my petite mother stem to stern when it passed through (that was all from the Shoots side)…they told me his name: Jeffery Layne…we called him “Jeffy”. I thought he looked like a little old man! Jeffy was very cautious…I was walking at eight months, but it was well after his first birthday before Jeff was brave enough to take his first independent steps. I remember him getting down on all fours and turning around backwards to negotiate any small change in the terrain. Three-year-old Jeffy stuck at the kitchen table playing with his balloon boat, while he was supposed to be eating his peas! The year Jeffy turned five was a particularly memorable one: We moved to Canada that summer, and for his birthday, Jeffy got a brand-new metallic green bike with a banana seat, monkey handlebars, and training wheels (which would stay on for the next three years…did I mention Jeff was cautious?). Jeffy also was sent reluctantly off to kindergarten, which in hindsight, I don’t think he was ready for…almost every day, I was summoned from my Grade Three classroom to come to the kindergarten, because “Jeffy’s crying again”. He missed about half the school year due to tonsillitis, which was lucky for me…I had just enough time in my own class to pass! 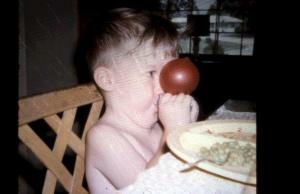 I remember being jealous when Jeffy came home from having his tonsils out…he got to have ice cream! Jeff with his brand new bike. That first year in Canada was also the year that we had our first cat named Tripper…Jeffy was particularly fond of him (and a decade or so later, named a second cat “Tripper”). We started attending church in Trenton, where Jeffy and the minister’s son, James, became best friends, and engineered many wild adventures, which you can read about here: https://writerwoman61.wordpress.com/2010/05/11/our-first-year-in-canada-part-1/, and here: https://writerwoman61.wordpress.com/2010/05/12/our-first-year-in%C2%A0canada%E2%80%A6part%C2%A02%E2%80%A6/. In 1970, our family moved to Rednersville, where we met our friends, Jimmy and Dougie. Jeffy and Dougie were the same age, and Jimmy was a year older. I used to organize plays and musical productions in our back yard, which the boys would ultimately get roped into. When I was ten, I had mastered Bob Dylan’s “Where Have All the Flowers Gone?” on the guitar, and recruited my seven-year-old brother to play the part of the girl picking the flowers. I made a “wig” out of paper cut into strips, and plopped it on Jeffy’s head. I played my song and sang, while he skipped around the back yard collecting the paper flowers I had carefully coloured. The audience loved it! Our dad built us a tree fort, and had purchased an old VW van, which he parked underneath it…the four of us spent hours playing in the van and the tree house. 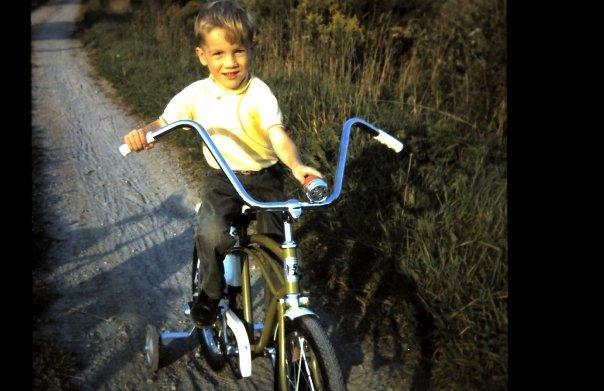 We also had a path to ride bikes around the house, since we weren’t allowed to ride on the road until later. One of our other favourite activities was a modified form of kickball, which we called “Running Around the Bases”. When Jeffy was eight (and I was eleven), I suggested we get a paper route together…we had about 50 customers between us. Jeffy did the closer houses, and I did the ones farther away. Sadly, Jeffy had all the good tippers on his part of the route…jealousy reared its ugly head again! The little bugger saved most of his money too, which I had great difficulty doing (although I did save enough to buy myself a ten-speed!). We spent every nice day outdoors, which wasn’t always the best thing for my brother…Jeffy had inherited our mom’s hay fever in a big way! I remember hearing him sneeze and sneeze and sneeze all summer, especially later on when he was picking vegetables for a living. Jeff and I at the Sandbanks, ca. 1972. My mom had gotten a job by the time Jeffy was eight, so we were left to our own devices after school, which often led to bickering…one time, he was chasing me, so I ran into the house and shot the little slide bolt on the door over (our only lock). Somehow, the lock ended up getting broken! Another time, I thought it’d be funny to put icing from the beaters onto Jeff’s nose…he apparently didn’t share my opinion! He chased me upstairs, and pushed me backwards into the bathtub! We rarely fought physically, but that incident has always stuck in my mind. Usually, I’d claw him with my nails if he started hitting me (he used to bite me, remember? )…our parents were not impressed! When Jeff was thirteen, our parents gave us some money they’d saved for us, probably about $1500 each. Jeff bought himself a lawn tractor from Sears, and soon had lawn mowing customers from all over the neighbourhood (I started a candy store). He was a hard worker, and earned enough money to buy his first car from the proceeds, a Renault that he’d drive around our fields because he wasn’t old enough to have a license yet. Jeff tried to teach me how to drive it, but I never mastered the art of letting the clutch out slowly enough not to stall the car! In the summer of 1982, Jeff was working for a market gardener picking produce, and got me on to the all-male crew…that was one of the funnest jobs I’ve ever had (and a lucky break since I’d been laid off from my job at the photo lab because I’d had to take six weeks off for my college internship!). It was in those cornfields that Jeff had some of his most spectacular sneezing fits! I left home in 1983 and moved to the Maritimes…Jeff stayed at our mom’s house for several years and helped look after her (she and our dad had divorced in 1985, and she was chronically ill). Later, he took a soldering course at Loyalist College. Jeff’s first job after finishing school was at Leigh Instruments in Carleton Place, where he met and later married my sister-in-law, Bev (I like to think he picked her because she’s a lot like me). In 1994, my niece, Taylor Dawn, was born. Jeff was a doting dad and taught Taylor useful things, like how to fetch beer for him and play golf. 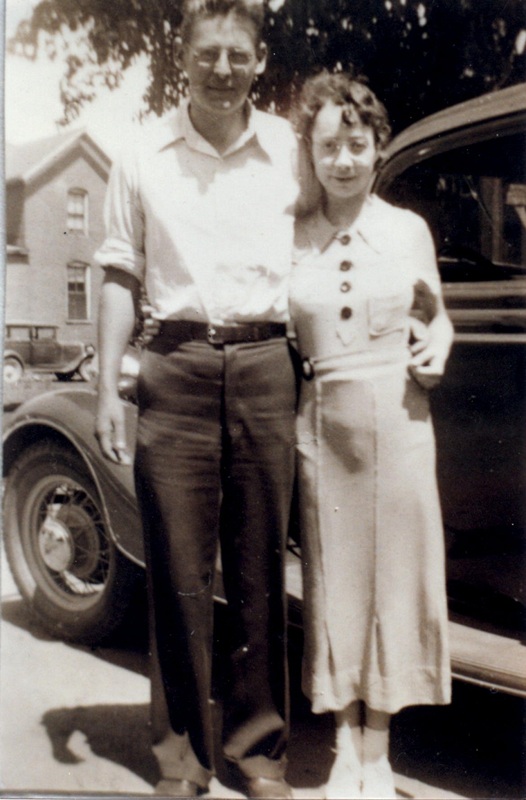 She inherited his love for classic cars (and beer), but she turned out all right anyway! Jeff, Bev and Tay visited my family in Moncton, New Brunswick, in the summer of 1996. We took them to the Magnetic Hill Zoo, which featured a small train to transport visitors around the property. We were all riding on the train, and Jeff stuck his head out the window to look at something behind us…he pulled it back in, just as we came to a signpost along the tracks, which was disturbingly close. When Jeff realized that he might have been decapitated had his head been out the window for another split second, he freaked out: “I could have been killed!” He talked about it for the rest of the afternoon year..I don’t think he appreciated my uncontrollable laughter at the situation…it made for a good story, though. Jeff’s always been a master storyteller! Today, Jeff is still working at what is essentially the same company in Carleton Place (its third incarnation is called “DRS”). He spends his spare time riding his motorcycle, working around the house and yard, and fishing small dead animals out of his back yard pool. Jeff has also organized a regular summer “Cruise Night” for the other classic car lovers in the area, which has raised several thousand dollars for the local children’s hospital over the years. 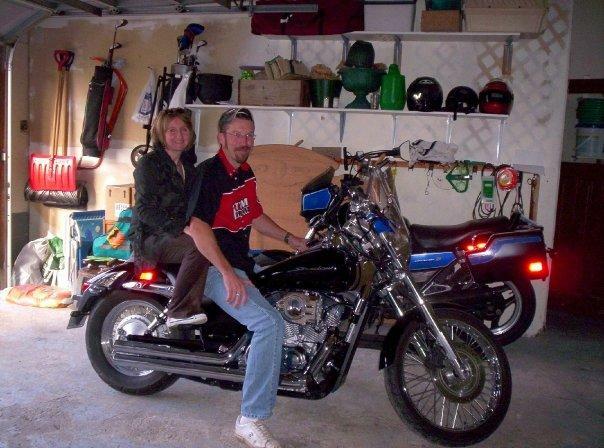 Jeff and Bev on the bike…they wear helmets when it’s moving! Happy 50th Birthday, Jeff! I tease you a lot, but you’re still my brother and I’m very proud of the man you’ve become! Note: Today would have been my mom’s 72nd birthday. 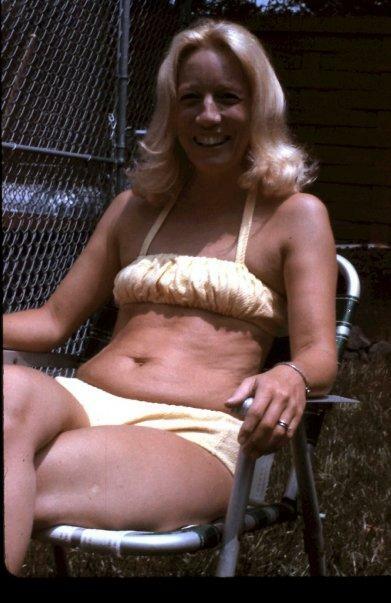 This was my second post, so there are a lot of people who haven’t seen it…I am rerunning it today in memory of my mom. Mom and Dad didn’t follow the typical path of Midwestern young people of their time: graduate high school, get married, and start popping out kids…Dad did a Bachelor’s in Journalism, followed by a Master’s in Divinity, and dreamed of going “back to the land” (he was raised in rural Ohio). Mom was a “townie” – an artist who also loved music. They were becoming more and more disillusioned with Nixon, the Vietnam War, and the crime in our neighbourhood. In the summer of ’69, Dad quit the church and he and Mom packed up our suburban house. Off we went to Southern Ontario, Canada. 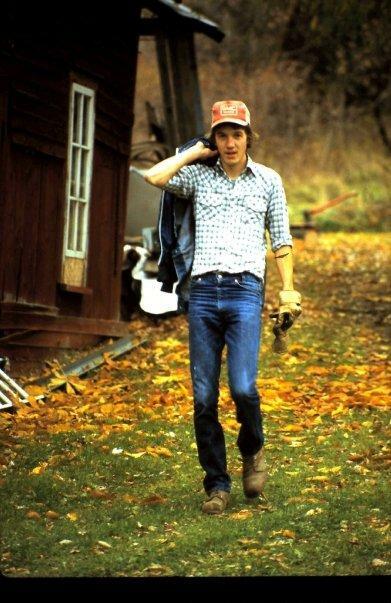 After renting a house for a year, we settled in an old farmhouse on 43 acres of land in Prince Edward County in 1970. I remember having a vegetable garden for several years when we first moved to the County. Mom and Dad bought a big chest freezer, and Mom worked hard freezing everything we managed to grow. Mom never forgot a plant that grew near the house where we lived when I was born in Kilbourne, Ohio in 1961. She didn’t know its proper name, but called it “Kilbourne Vine.” It was pretty, and it grew wild – that’s probably one reason it appealed to her. Fast forward to the early 1980’s…Mom, my brother and I were planning a trip to visit relatives in Ohio. It was on that vacation that Mom decided to bring a piece of the past home with her: she wanted to plant some “Kilbourne Vine” in our yard in Ontario. Having arrived at my Grandad’s house in Bellefontaine, we set out for Kilbourne one day. We got there about lunchtime, and Mom guided us to our old house. We waited in the car while she jumped out and rang the doorbell. No one answered. My brother and I were somewhat horrified at what happened next…my mom began pulling pieces of the “Kilbourne Vine” out of the yard! We kept our ears open for the scream of sirens, as we imagined being arrested by the Kilbourne sheriff for pilfering plants without permission. Mom came back to the car, showing us her prize in triumph. We left in a hurry, hoping some nosy neighbor hadn’t alerted the authorities! We made it back to Bellefontaine without incident…the next hurdle would be getting through Canada Customs. Having made many trips back and forth to Ohio over the years, Mom knew that bringing plants into Canada was illegal, but she had a plan: “I’ll put it on the floor of the back seat in plain sight, and if they say anything, I’ll just say that I didn’t know you couldn’t import plants,” she said. My mom the rebel! We crossed the Ambassador Bridge and pulled up to the Canada Customs booth in Windsor. My brother was driving. The Customs officer was female, in her early 20’s, and was looking at Jeff with love in her eyes…she asked three questions (none of which pertained to the plant on the floor), and we were through! We arrived home, and Mom planted the vine in her flower garden. It thrived in its new home. Twenty years later, Mom took a piece of it with her when she sold our house and moved in with my brother and his family in Carleton Place, Ontario. Mom died in September of 2007. The urn with her ashes sits on a stone wall in Jeff’s back yard, with Kilbourne vine planted close by. I have seeds from the Kilbourne vine…I will find a special place and plant it here, too, in Mom’s memory. The Love Link…Happy 100th, Grandma T.! Yesterday would have been my Grandma Thompson’s 100th birthday…I can’t think of a more appropriate day to do a tribute to her than the hundredth anniversary of International Women’s Day! I learned so much about life from both my Grandma and my mom (her daughter)! Martha Alinette Taylor was the third child of five born to Lewis A. Taylor and Marie C. (Auer) Taylor. She was born March 7, 1911 at home in Marysville, Ohio. She was called “Martha” as a child, but preferred “Alinette” as an adult (“Alinette” was a combination of her grandmothers’ names: Alice and Annette). When Grandma was about four, the family moved to her Grandma Taylor’s farm, about 8 miles from Marysville on the Beecher Side Road (her Grandma was Alice Beecher Taylor, a distant cousin of the “famous” Beechers). The farm was quite a shock for Grandma’s mom (my Mamma), who had grown up with all the modern conveniences in town, and was not accustomed to houses with no running water, no electricity, no furnace, and no indoor plumbing! The family shared the farmhouse with dozens of rats and mice too! Grandma’s dad started on the farm with hogs, but then switched to sheep farming. He also raised Border Collies specifically to work livestock. One of his dogs, Rex, was a regular performer at the Ohio State Fair, and got so famous that he was even used in a national film! Sadly, Rex was killed by a car when he was only 5 years old. As a girl in high school, Grandma’s teachers always wanted her to become a teacher, but she had her heart set on office work: when her Dad cleaned out his desk, she’d go through the wastebasket and salvage papers she could play “office” with! Grandma and her mom were always close…Grandma’s teenaged friends were shocked when she told them she’d ask her mother if they had questions about S-E-X…they wouldn’t think of posing the questions to their own mothers! After graduation from high school, Grandma was given two scholarships from local colleges, but her dad didn’t have the money for her to go, and Grandma wasn’t healthy enough to work part-time while she went to school. She took part of a correspondence course in office work (typing and shorthand), before being offered a secretary/bookkeeper job with the Farm Bureau. It was September, 1931…the salary was $40 a month. Grandma took the position, and moved into a room near the office. Her boss, a “Mr. Bear”, was initially not keen on her being hired, and co-workers told her he tried to get her to quit by piling on the work. Grandma did it anyway. She worked there for 3 and 1/2 years, and when she was gone, they hired TWO women to take her place! When she wasn’t working, Grandma was a bit lonely…she’d heard that her old piano teacher, Jennie Sherwood, had opened a music school in her home nearby, and that Miss Sherwood was staging dramatic productions there. Grandma took some drama lessons, and it was at one of the shows that she met my Grandad, Lewis C. Thompson…he was the good-looking stage manager! The two were talking backstage, and Grandad was so absorbed, he missed his cue to open the curtain! He didn’t ask her out that night, but Grandma noticed that the Floyd’s Dairy milk truck he drove seemed to go by her office a lot during the day…Grandad honked and waved every time. It was two weeks before he asked her out…it wasn’t long before Grandma’s milkman was “her milkman”! They used to put notes to each other in the empty milk bottles, and Grandma rigged her bedroom light with a string so that when Grandad went by at 4:30 a.m. and honked, she’s turn the light on and off in response. Grandma and Grandad were married on September 21, 1934 in an evening ceremony at her family’s farm…it was an intimate affair…her parents couldn’t afford a big wedding! The couple went on to have four daughters: Geraldine (Jerry) in 1935, Dorothy (Dottie – my mom) in 1939, Judy in 1942, and Connie in 1954 (she was a happy surprise!). Both worked full-time for many years: Grandma became the accountant at Mary Rutan Hospital in Bellefontaine, and then the Comptroller at Carter Steel. Grandad ran a filling station, drove a Columbus city bus, managed the Holland Theatre in Bellefontaine, and then worked in management for Super Food Services (a grocery wholesaler). Grandad and Grandma in 1935...that baby bump is my Aunt Jerry! When I was a young child, we would visit Grandma and Grandad on holidays, as we lived two hours away. At Easter, Grandma would fill a decorated coffee can with candy for each grandchild…the cans had our names on them. 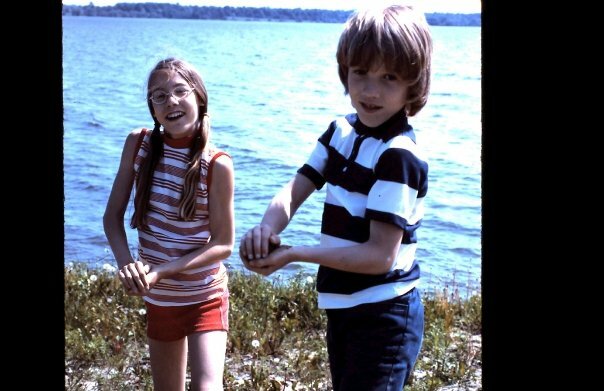 In 1969, our family moved to Canada, 550 miles away from Grandma’s, so our visits with them were reduced to two a year: summer holidays and at Christmas. One Christmas tradition Grandma did in the 1970’s was called the Grab Bag. All her daughters had young families: after opening the gifts at Christmas time, the grandchildren would go to the Rumpus Room, where there was a big pile of brown paper bags in the middle of the floor. We would take turns “grabbing” a bag for our family, until they were all gone (it was fair, because all the daughters had a girl and a boy!). All through the year, Grandma would stock up on paper products, dime store items, and other small essentials that a family could use. She’d save grocery bags, and before Christmas, pack the items in them and staple them shut (in later years, my cousin Barb and I sometimes got to help her…that was fun). My Grandma was only about 4’11” tall due to her spinal disintegration, but she had a lot of energy in her small frame! She was a big hugger, and loved all of her grandchildren dearly! We were all devastated when we got the news that Grandma had suffered a heart attack and died on February 15, 1979. My Grandad followed her a little over five years later, after succumbing to his second bout with cancer. My Grandma wasn’t a traditional woman by any means, but she was a wonderful example to all of us! Note: Much of the information for this post came from Grandma’s memoirs, which she wrote for her daughters a couple of years before she died. My friend Kathy at Reinventing the Event Horizon, asked her blogging friends to post something for Haiti on the one-year anniversary of the devastating earthquake there. Kathy and her partner, Sara, currently live in Haiti…Sara works for one of the aid organizations providing help to the survivors. Some of Dad’s friends from seminary were making a trip to Haiti in order to experience the abject poverty they’d heard about there. They invited he and my mom to go with them. My younger brother and I were sent to stay with some family friends, and my parents set off (with 3 or 4 other people) in our 1965 Chevy for Miami. They survived their first-ever plane ride, landing safely in Port-au-Prince at the tiny airport. Before the trip, the travellers had contacted local doctors and dentists and solicited donations of their free samples, and collected cotton clothing from whoever they could hit up…the goods were loaded on to an Air Force plane for delivery to Haiti. The 13-person delegation (mostly couples and one single) was met by its host, a man from Indiana who had been doing relief work in Haiti for a number of years. While they were there, this man was summoned for a meeting with “Papa Doc” (the Haitian dictator) – this caused a fair amount of concern among the visitors, but it turned out all right. Papa Doc’s secret police, known locally as the Tonton Macoutes (from a Creole term for bogeyman), patrolled the streets in their WWII army fatigues, their sidearms in prominent view. Dad reports that there was no trouble with them while he was there. The group was taken to a hotel, which would be its home for the next week. According to my dad, the hotel was “nothing fancy”…he grew up in rural Ohio without indoor plumbing…I would imagine it was fairly rudimentary if that’s how he described it! He said that the electrical wiring was just attached to the walls of the hotel rooms (there were flush toilets, however!). The group was warned not to drink the water, or eat local fruits and vegetables. They ate all their meals at the hotel, and were surprised at the end of their stay to find that a young man who looked about eighteen had been their “chef” for the week! Sleeping was challenging…the locals would carry on vodou (the Haitian national religion) rituals late at night…my parents would often hear the chanting and the drums, something they’d never been exposed to in Ohio! Dad and Mom travelled with the others when leaving the hotel…it was the only safe way. There were kids begging everywhere, and young people with pencils or chalk and paper who offered to draw a picture for money. “You could get anything for a dollar,” says Dad. There were open air markets where my parents purchased a large drum, two smaller ones, a small wooden statue, a large wooden mask, and wooden figurines of a Haitian man and woman to put on the wall (I still have those today). These items were all handmade. Most Haitians they encountered were very dark-skinned and very poor…they lived in “whatever they could scrabble together”. The average income at the time was less than $200 annually. The mulattoes (mixed black and white) are the privileged class in Haiti, and live in neighbourhoods with houses similar to what you would see in Miami. One of the group’s excursions was touring the new Grace Children’s Hospital in Port-au-Prince, which had been opened by International Child Care that year to treat children with tuberculosis. My mom was shocked to see three babies sharing a bed. My dad says the smell in the facility was unbelievable. There were also a couple of scary trips to the rural areas around the city on a rickety bus. Dad recounts that they visited a house where one woman cared for about 70 orphans. “She had a couple of women there to help her.” The group attended a church service conducted in a three-walled structure: “There was no fourth wall…it was so warm there, they didn’t need one,” says Dad. While they were in Haiti, my parents took more than a hundred slides, and made tape recordings of some of the things they’d heard. The experience was life-changing for both of them. When they came back home to Ohio, they presented their “Haiti Programme” to local people, who were moved by the photos of children with pot bellies and insects crawling on their faces, to donate money to Haitian relief efforts (many children did not live until their fifth birthday because of malnutrition). Fast forward to 2011…it doesn’t seem that much has changed in Haiti since my parents travelled there more than 40 years ago. The people there are probably worse off now…they are still dealing with corrupt politicians, natural disasters, haphazard infrastructure, high unemployment, low literacy, malnutrition, and now AIDS and cholera epidemics. I don’t have the answers…I hope this post will move my readers to think about what they can do to help alleviate some of the suffering in Haiti. We moved to Ontario when I was eight…Jeff and I were ecstatic to live where there was snow pretty much continuously from mid-November through February (and sometimes March)! Our parents bought us a big wooden toboggan, and we also had Crazy Carpets to use by ourselves. We had lots of snow the winter of 1970-71…my dad would pile the snow he shovelled out of our driveway at the end of it, where there was a deep ditch. With the snowpile being about ten or twelve feet high, we had a great long run from the top of the pile down into the ditch…often we didn’t even bother using vehicles…we’d just slide on the bums of our snow-encrusted layers of jeans (we’d outgrown our snowpants by then – we’d just put on 2 or 3 pairs of pants and play until we were soaked to the skin!). 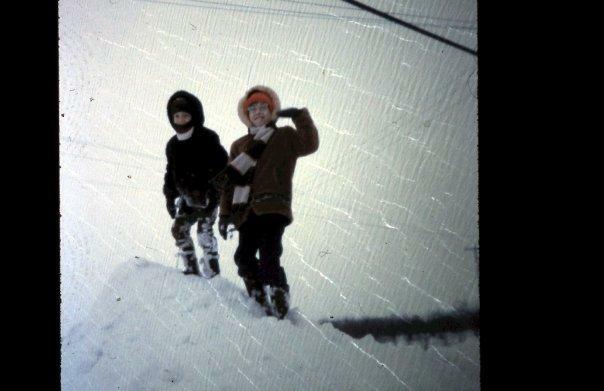 Here's a picture of Jeff and I standing on top of our snowpile in the winter of 1970-71...yes, those are power/phone lines beside our heads! We had great fun sliding behind/beside the Rednersville house too! I remember at least one occasion when my brother and I were on the toboggan together and going very fast, when suddenly, we stopped dead and we both flew off the toboggan landing face-first in the snow. We weren’t hurt, and couldn’t stop laughing because when I emerged from the snowbank, the snow had packed itself into my glasses! There was a big field beside the house. One winter, we’d had freezing rain, which had created a beautiful crust on about eight inches of snow…it was so slippery, you could barely walk on it! Our family decided to take advantage of the excellent conditions and got out the toboggan. That was the only time I recall my mom actually going out sliding with us (Dad came out quite often). Mom sat on the toboggan by herself, and Dad let go when she was ready. A minute or two later, we heard a thump and a blood-curdling yell: “Dave…I think I broke my back!” My mom had “found” the one apple tree in the middle of the field! Dad made his way out to the scene of the accident, loaded Mom back onto the toboggan, and pulled it to the car. After we were all in, we left for the emergency room. Mom’s back wasn’t broken, just badly bruised! 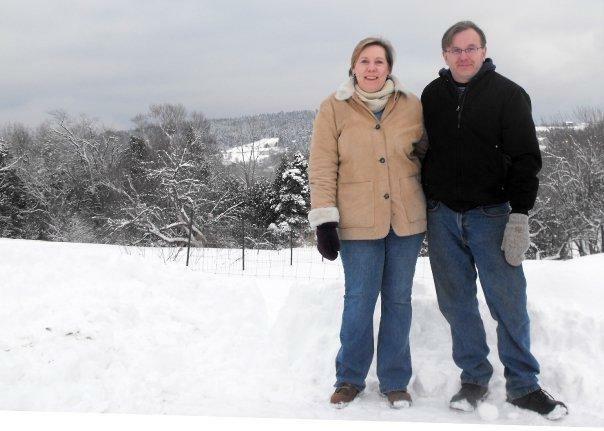 We were lucky at the Rednersville house to have 43 acres of land with a big hill behind us. With our friends, Jimmy and Dougie, we could go to the top of the hill, and slide several hundred feet, almost all the way back to the house. Crazy Carpets were the best vehicle for that, once the trail was established. One winter, there was a friendly dog around which we christened “Wolfie” because he sort of looked like one. Wolfie used to like to jump on our backs as we hurtled down the hill on our stomachs on our Crazy Carpets. The worst injury we ever got was ending up in thorn bushes! A couple of times, my best friend, Angela, took me out “Skidooing” in the woods behind her house. We were about eleven, I think (snowmobiles were a lot smaller then). That was always fun! My dad hated it when snowmobilers trespassed on our property…he’d go out and yell at them until they left! I moved to New Brunswick in 1984…winter was different again…you could have snow in late October, right through April sometimes! There is also not much of a spring…you can literally go from wearing your parka to wearing shorts (and back again, sometimes several times). There is no gradual warming like we had in Ontario. I lived in Moncton in February of 1992 when an all-time snowfall record was broken…Moncton had a total of fourteen feet of snow that month in THREE storms. The biggest storm was on February 1st. At the time, I worked at a non-profit agency which was about a 10-block walk from our apartment, and we didn’t have a car. Buses were off the road. I walked to work, wearing a skirt (I was wearing other clothes too!). When we got to the building, there was a snowbank about twelve feet high in front of it! I met one of my co-workers outside, and together we decided to go around the corner and get a coffee, in hopes that our boss might arrive soon, equipped with a shovel to dig a path to the front door! We had our coffee, and went back to work…everything was as it was when we left. Since it was already past time to start work, I decided to bite the bullet, and climb the snowbank! I probably didn’t resemble a mountain goat very much in my long black wool coat, and knee-high boots as I clambered up the hill. When we arrived in the office, there was our boss, clad in a snowmobile suit…she had come in the back door, and hadn’t thought about us trying to get in the front! I never liked her! I tried to find public domain photos of the big Moncton snowstorm on the Internet, but failed. I remember a paint store on St. George St. cutting “windows” in the snowbank in front of their store and setting paint cans in them to let people know they were there! Winters in Moncton could be very cold too…I remember one year that we had three solid weeks of windchills between -30 and -36 C. (which is almost the same temperature in Fahrenheit). School was never cancelled for cold weather, and every day I walked Kaylee the three blocks to her elementary school. It’s a wonder we didn’t turn into Popsicles! I moved to Saint John, New Brunswick in November of 1997. Winters are milder in this area due to the proximity to the ocean. There are a lot of freeze/thaw cycles, and a lot more ice. We had some freezing rain in November of 2007 when my dad was undergoing radiation therapy for prostate cancer. About 6:30 a.m., he was walking to the bus stop to go to the hospital, and ended up flat on his back in the driveway two doors from our house. He got up, and continued on his way. While Dad was having his treatment, he mentioned that he’d had a fall and that he might need an X-ray. The X-ray confirmed that he’d cracked five ribs. I didn’t find out about the accident until several hours later…when I asked Dad why he didn’t just come back home, he said, “I didn’t want to mess up their schedule at radiation!” Sometimes, my dad’s so stoic, I just want to shake him! I was glad he wasn’t more seriously injured though! It’s been raining all week, with more to come…I hope we get some snow before Christmas! 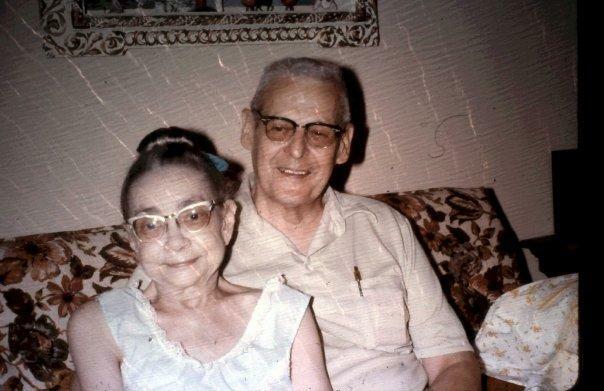 My paternal grandparents were great role models for how to live with very little…they lived on a number of small farms in Ohio, raising all their own vegetables, eggs, and sometimes meat. Grandma made all their bread as well, in a huge, dark brown stoneware bowl. Their last farm before Grandpa died was a sheep farm…they also had a couple of goats. This farm had a cold water tap in the kitchen, but hot water was heated in a large kettle on top of the stove. Baths were taken in a copper boiler. The outhouse was a dilapidated wooden structure (2 holes as I recall) where one used the pages of the Bellefontaine Examiner (torn into small pieces) as toilet paper. 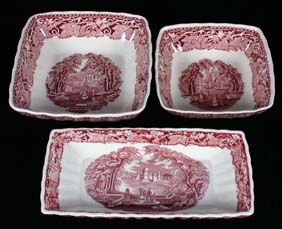 Every bed had a chamber pot tucked under it for the night. I remember Grandma squeezing the water out of her beige, opaque stockings with the handcranked wringer washer, and the clothesline full of freshly washed laundry. There were at least seven rocking chairs in the house, of varying styles and ages. To save gas, my Grandpa used to turn off the car, put it in neutral, and coast down the hills (there are a lot in Central Ohio). I remember Grandma washing every piece of aluminum foil and putting it in a drawer to reuse. She was also a string saver. The radio was the only electrical form of entertainment – there was no TV. The shelves of a big cabinet in the living room were stocked with books, board games (Monopoly, Anagrams, and Pit), puzzles (which Grandpa and I did together), and scrap paper for drawing on. On the bottom shelf, Grandma’s diaries (one for each year since the 1930’s) were arranged in chronological order. There was never much juicy information in them, mostly weather and trivia about relatives/neighbours I didn’t know, although Grandma also used to record gardening details: “Planted peas today.” Grandma was the one who taught me how to crochet when I was five, using old stockings for practice chaining. When I was small, I used to love going out to the chicken house with Grandma to collect the eggs…I still fondly remember the smell of the chickens. We would put the big brown eggs in a wicker basket and carry them into the house, with Laddie the collie following close at our heels. Another favourite task was going into the garden to harvest…Grandma grew many exotic things not in my daily suburban diet: zucchini and other kinds of squash, cabbage, and little yellow tomatoes shaped like light bulbs. Those were the best: we would pop them into our mouths, where the juice and seeds would explode into a sweet taste sensation! It was my Grandma who used to cut cabbage into slices and spread peanut butter on them for an afternoon snack (I still love that today!). In the woods near the house, there were hundreds of wild blackberry bushes. I never met a berry I didn’t like, but blackberries are my absolute favourite! For dessert, Grandma would make a biscuit dough, bake it, and then cover it with berries. 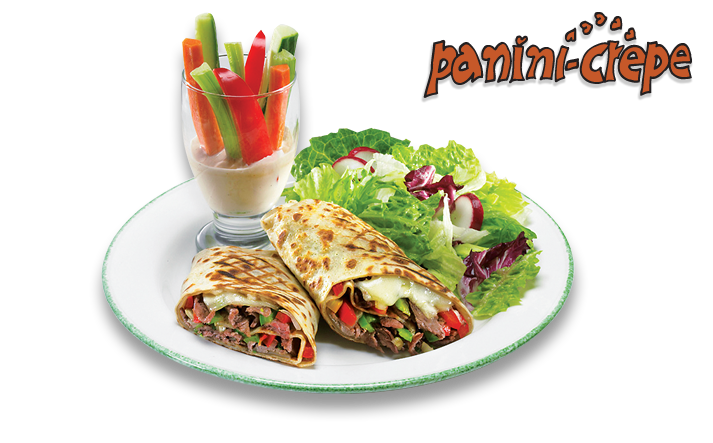 We’d pour a little milk on it, and voila! – blackberry cobbler! Another treat was her molasses cookies – soft morsels almost as big as our heads which she stacked in round cardboard Quaker Oats containers. We ate our meals at Grandma’s house on transferware dishes – I remember the square, deep-dish plates of random colours and patterns…I wish I had a couple of them today! 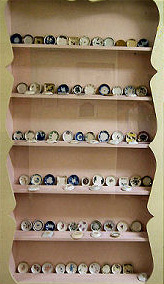 Grandma was never much for fancy stuff, but she did have a large collection of butter pats, which was donated to the local museum when she died. She enjoyed showing us her new acquisitions when we visited. My Grandpa was killed in a car accident in 1974, and Grandma sold the farm and moved to an apartment in town. She still planted a garden, and we still enjoyed many meals at her house. She died after a short bout with colon cancer in 1987. I never forgot about light bulb tomatoes – last year, we went all over New Brunswick looking for plants, but no one had them! This year, I was very excited to find heirloom seeds for them in the Hope Seeds catalogue (see “Companies I Like” for link). I will plant them in memory of my grandparents. I have a secret blackberry patch that I go back to every summer, and pick berries…I think of Grandma every time we eat them!